SP3 Diamond Technologies has the largest HFCVD deposition capacity in North America. The company is currently operating 8 chambers, a facility capable of 20 chambers, and the ability to provision new reactors in 12 weeks. Total throughput is dependent on coating thicknesses and load sizes. As a reference, SP3 Diamond Technologies can process ¼ in. diameter cutting tools with a 9um coating at a rate of 30,000 per month. CONTACT US for more details on our capacity to coat your cutting tools, electrodes, seals, CMP pad conditioners, silicon wafers and more. SP3 Diamond Technologies has the largest HFCVD deposition capacity in North America. Our typical turn-time for cutting tools is 2-3 weeks. For regularly scheduled orders issued under a purchase agreement, the turn-time is 2 weeks. Typical turn-times for electrodes, seals, CMP pad conditioners, silicon wafer and others with coating thicknesses of <1um – 50um is 2 – 5 weeks, depending on thickness. CONTACT US if you have a special request. CVD diamond coating is a complex process. In order for it to be successful the incoming substrate must be of the proper material and manufactured appropriately. In addition, SP3 Diamond Technologies will prepare each substrate prior to the diamond deposition process, to ensure optimal adhesion. 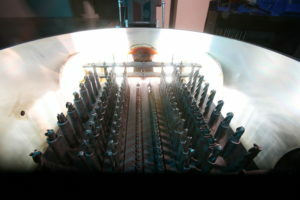 And finally, the deposition process within the reactor, which is a complex recipe of pressure, temperature, time, and gases, must be tightly controlled. Incoming inspection (sampled) to ensure the substrate is of the specified materials and manufactured appropriately. In addition, we perform dimensional analysis on incoming cutting tools on a sampled basis. Coating services are controlled through a sophisticated Manufacturing Execution System (MES). Every coating services order is controlled through a unique bar coded traveler that specifies that order’s process requirements. These requirements are based on many factors and can be customized based on our partnership with our customers. Substrate traceability is maintained, and process data history is collected, via the MES throughout the entire coating process. All reactors are computer controlled and each recipe is revision controlled to ensure repeatability. Process data is continually collected and monitored during each deposition cycle. Outgoing inspection is performed for all orders and any discrepancies are identified and reported with the shipment. This includes any abnormalities in the coating, substrate integrity, or dimensional parameters. We encourage our customers to visit us as we are proud to show off our facility. Please CONTACT US with your requests. ©2019 SP3 Diamond Tech. All Rights Reserved.